yes, you could use simple too, but since one of its most commonly used definitions is also tonto, as well as ordinary and common, I would avoid it as a fairly false cognate. besides, sencillo means unassuming, plain, modest - in ways that simple in Spanish doesn't always. 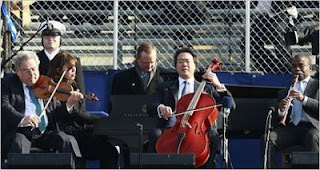 At the inauguration the star studded quartet played a version of Simple Gifts, one of my favorite songs. You can download it here.